Law enforcement officers see first hand the consequences of motor vehicle crashes. They also see first hand the behaviors that cause these consequences. From conducting education and enforcement campaigns to identifying unsafe conditions, law enforcement officers can play multiple roles in SRTS programs. Demands on a police department and the level of participation departments can offer varies from community to community. It is important to understand what the local police resources are. For some communities, law enforcement resources must be reserved for situations where students face harm or when unsafe behaviors persist despite the use of other methods. These officers are assigned to specialize in traffic enforcement. They respond quickly to traffic safety hot-spots. These officers are generally assigned to a specific portion of the city and work on problem areas. While they do not specialize in traffic enforcement, they can be called in for enforcement activities at the start and end of school days and help coordinate with motor officers. Some police officers are assigned to schools and concentrate on special problems such as drugs, gangs, and other on-campus problems. They can also be used to help solve special traffic problems on or near the campus and can coordinate with the motor officers and CAOs. 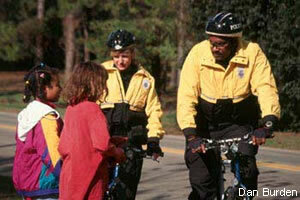 Teach safety issues to children, school officials, parents and the community. Evaluate local traffic concerns, observe problem areas and behaviors and provide input about safe routes. Provide an enforcement presence that discourages dangerous behaviors on and off the school campus. This may mean issuing warnings to drivers breaking traffic laws. Drivers who have made a minor error will often respond to a warning from an officer by being more careful. Drivers who continue to violate traffic laws need to be ticketed. Monitor crossing guards and make sure they are acting safely in the street and are not taking chances or over-stepping their duties as guards. Monitor students to ensure that they cross at safe locations and do not take unnecessary risks.